I lucked out with Priceline once again. $138.00 round trip, flying direct from Minneapolis to Washington, DC’s National Airport, and then with a single stop in Chicago on the way home. I flew in a day early, something you learn to do when buying tickets from Priceline. You can’t pick your departure time, and while you may need to get there in the morning, your plane may leave in the evening. This gave me an opportunity to visit the National Zoo. I stayed in a hostel for only $38, which bought me a room with my own bath. It was in one of those old, narrow row houses near Dupont Circle. The other houses have all been reclaimed and restored, and my room on the second floor had a magnificent carved-wood Victorian fireplace — but the ceiling had squares of plastic taped to it to catch leaks and the furnishings were shabby and mismatched. I was excited, so I didn’t sleep very well. I went to the zoo early Friday morning. The weather had turned hot, and pandas like it cool. But it was already in the 80s when I arrived. Only the female was out, and she was asleep. I wandered off to see the Think Tank where orangutans come to communicate with humans via computer. Nothing going on by way of communication, but a single female orang was lying on a white sheet spread over a heap of hay, looking exceedingly comfortable. A few red grapes were arranged on the sheet where she could easily reach them, and she regarded the human visitors on the other side of the glass with the condescension of a princess. Suddenly an enormous male appeared in the room and she was gone before I could blink. He came to the bed, sniffed it suspiciously, ate a grape, and looked around for more clues. But she was back in a dim corner, and other females had meanwhile arrived, so there was no punishment meted out. The orangs come from their enclosure via cables strung between narrow wooden towers, so they volunteer to take part in this activity. That so many do shows either how intent they are on their lessons, or how boring it is to have nothing else to do. I used the Metro subway system to get around, and it’s great: clean, fast and frequent. My only complaint was that all the literature suggested the Arlington Crystal Radisson was on a subway stop. It was actually a considerable walk through a tunnel from the station, especially when encumbered by a big purse, a bigger hatbox, a knitting bag, and a large, heavy suitcase. The tunnel was lined with numerous shops and it’s a famous place to go shopping, but when I got there, all I wanted was a little electric cart to come along and give me a ride. No such luck. The hotel was great, my room was large and luxurious — especially after the hostel — and I wanted a nap, but I decided I’d better go check in. I met Luci Zahray at sign-in Friday afternoon and sat with her awhile. She is leaving Texas to move to Muncie, IN, has accept a job offer, and has been looking for a house. When she said she wasn’t sure what she’s going to do next, I was surprised into saying, “Why, you’re moving to Muncie, of course!” She’s got the last-minute jitters people get when faced with a big, life-changing move, I guess. Anyway, she seemed cheered by my confident tone. I later found out she’d said something to Jeanne Dams about her uncertainty, and Jeanne said almost exactly the same thing to her. Everyone agrees this is a wonderful opportunity for Luci, so if you find her dithering, now you know what to say. I gravitated into the dealers’ room and to the antique clothing dealer. She immediately handed me a wonderful old hat woven of horse mane and tail hair. Think of an old black and white photo from the early thirties. There’s grandmother in a long, shapeless dark dress and lace-up oxford shoes and a domed hat shoved well down on her head. This is that hat. I went then to meet with the members of the panel I was to be on Saturday morning, and we had an amusing exchange of views. The moderator had some excellent questions — some of them the equivalent of straight lines — and we broke up with the notion we were going to be hot stuff in the morning. I ran into my editor at the check-in desk, and she was very pleased to see me. That evening, she joined other editors and executives from Berkley to take all the Berkley authors out to dinner at Ruth’s Cris Steakhouse. We had a room all to ourselves. Champagne flowed, and everyone talked, and the food was excellent — but it was nearly eleven before we got back to the hotel. I was really, really tired, too tired to sleep well — plus I forgot to draw the curtains, and the brilliant Saturday sunlight woke me before six. The panel went well, considering it started at 9 am. It was on writing multiple series, and one question was, “Would you quit one of the series if you had a chance?” Most agreed they would, but I was the only one to say, “I did!” Because my collaboration with Gail Frazer broke up, and it was I who initiated it. Diane Finney, fellow member of Twin Sisters in Crime (Minneapolis-St. Paul chapter) and I kept running into one another and finally had a conversation in which we agreed it was silly for both of us to have rooms with two beds in them when we could save money by sharing one together. So she moved in with me Saturday. We crossed paths only rarely and never got in one another’s way, which was really nice. Thanks, Diane! The Banquet Saturday was excellent. Good speakers, no long-winded speeches, and Berkley, which had authors up for two Agathas, won Best First. The teapots have been remodeled and are actually quite attractive now. Is there anyone I haven’t told I’d love to win one? But first I have to get nominated. After the banquet I went to Mary Morman’s room, and got reacquainted with her and some of her co-conspirators. Mary Morman is responsible for Malice, having thought up and run the first one, with the aid of said co-conspirators. We had a grand time reminiscing about the first Malice, which was held in a hotel crumbling around the edges. Mary still has a note from one of the room service people, asking that the person sleeping there please try not to leave a mess, as the service person was very over worked. But it was a good event, and the second one was held in a much nicer hotel. One of Mary’s friends remembers seeing a tab attached to a mystery novel in a bookstore window noting the novel was an “Agatha Winner,” and how it struck her for the first time how what had seemed like a grand excuse for a big party was, in fact, being taken seriously by others in the book world. I stayed longer than I meant to, then hustled up to bed. But because of the presence of a relative stranger in the room, I again slept poorly Sunday night. Sunday morning my editor, Gail Fortune, took me to breakfast. I was by now woozy from lack of sleep. But I remember very clearly her pleasure in being able to twit those who in production meetings had predicted that a mystery series based on needlework wouldn’t fly with taunts of “Third printing!” and even “Fifth printing!” She also reiterated how excited she is about the fifth novel, A Murderous Yarn, which uses an antique car run as its background. She feels it is the best one so far. I hope it lives up to what she is currently feeling about it. 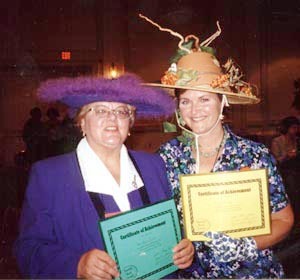 Closing ceremonies included two hat contests, a Most Creative Hat and a Most Beautiful Hat. All day Sunday people assured me I had the Most Beautiful Hat competition sewed up. I was wearing that gorgeous purple hat with my gorgeous purple suit and I looked great. We had to write our names and a short description of the hat on a card, which was read by a woman who didn’t get a chance to read them ahead of time. I think I had the best line on mine: “This is a hat which makes women say, ‘She has a whole lot more nerve than I do. '” But I was second runner-up. Diane Finney was second runner-up in her Creative Hat competition, which also surprised me. She had taken a broken clay pot and put it over the crown of a straw hat and further ornamented it with vines and those twisted dry sticks flower arrangers are fond of. When I first saw it in our room, I thought it was a flower arrangement, it was so decorative. Dianne checked out Sunday, so I had the room to myself again. I went up to bed, but was so wakeful I decided to go find the laundry room and wash a few things. When I am very tired, I make odd decisions. So I went to bed around eleven-thirty, having remembered to draw the curtains, but had reached that peculiar state of exhaustion in which real rest becomes impossible. I slept fitfully till about five, then got up and showered and dressed and went downstairs to catch an early shuttle to National, from which I caught an earlier bus to Dulles, at a cost of $16, as opposed to a trip by taxi that would have cost $45. Dragging that infandous suitcase and the hat box (now crammed with an additional hat) and the big purse and the knitting bag, I walked a mere quarter mile to the nearest United ticket counter, which proved to be the international ticket counter (but she checked my bag anyway, leaving me concerned that while I was returning to Minneapolis, my bag was headed for Singapore). From there I walked another quarter mile to an RV-size waiting room which departed from the terminal a few minutes later and took me across aircraft parking areas and taxi-ways to another terminal. In my peculiar state of exhaustion, it seemed the most normal thing in the world for an airport waiting room to pick itself up and travel to another terminal. The wrong end of it, as it transpired. But the look on my face awoke compassion in the woman behind the counter in D Concourse, because she flagged down an electric vehicle which drove me a long, long way to the correct concourse in, I think, another zip code. There I had a surreal conversation with a Japanese woman who had quit her job a few months ago and took her life’s savings out to pay for an excursion all over Europe. She said, and it seemed logical at the time, that if she waited until normal retirement age, she wouldn’t have the energy to travel. Besides, her boss was driving her nuts. Sounded very American to me, but she’s a Japanese national and lives in Japan. Her name is Kyota and she may contact me by email one of these days. I was pleased to find that though I had a stop in Chicago, I wouldn’t even have to get off the plane — except the flight was cancelled because of violent thunderstorms. That started a lengthy wait as more and more flights from the east were cancelled, leaving United with fewer and fewer planes to fly out of Chicago. It was interesting to watch — as each successive flight was cancelled an ever-bigger herd of travelers thundered off to the next gate, clamoring to get put on standby. Fortunately, I got behind a woman my age who must exercise regularly, because she set a truly blistering pace. I, without my anchor of a suitcase, managed to keep up with her, so I was high on the list. (Though someone told me it’s not the number you are on the list, it’s what you paid for your ticket. This really disheartened me, because I only paid $138. But she was wrong, or they blundered, because my name was called about fifth or sixth.) The man behind the counter (with a great sense of the dramatic) kept telling us where the aircraft we hoped to ride on was diverted to in its attempt to get around the line of storms, which blocked the entire eastern seaboard. “It’s taken off from Albany,” he announced. Later, “It had to fly to Baltimore.” Sighs. Later, “It made it to St. Louis.” Cheers “It has left St. Louis but had to fly west.” Groans. “It is approaching Chicago.” Hurrah! “It has landed here in Chicago.” Wild cheering. “It will be here at the gate in a few minutes.” Bewildered passengers, disembarking two hours late, were met by a wildly-eager crowd. “I am going to call standby names twice. If you haven’t answered by the second call, your name will be removed from the list.” And my name was called before all the seats were filled. I was going home.